I have measured out my life with homemade breads. From “helping” my mother make brown soda loaves on Saturday mornings, through to my teenaged attempts at yeast baking with orange and raisin scrolls, coming home from college to make Christmas stollen, adventures with my first bread machine in NZ and playing with sourdough at Ballymaloe and at home, bread ìs one of the most satisfying things that I pull together in the kitchen. It’s also about winning hearts and influencing people. While living in Christchurch, one of the loaves on high rotation was a brown soda bread that tasted of Ireland and never failed to impress our regular Kiwi visitors. That bread had longevity: it made it into Chch newspaper The Press and I was honoured to find it featured in an article on post-earthquake no-fuss comfort food to, as author Kate Fraser said, “cheer and warm and share.” Never underestimate the power of a simple loaf. Val O’Connor’s Bread on the Table is a collection of the kind of recipes that you can pull together with little effort and which leave your house smelling like that of the most domestic of domestic goddesses. This copy arrived from the publishers last week; since then there has been a rich Porter, Treacle & Walnut Bread, boxty for supper, a Wholemeal and Honey Loaf for breakfast toast along with kid-friendly seed-encrusted mini rolls and chocolate swirls. In short, I’m thoroughly enjoying baking my way through the book and have even (whisper it) used my bread machine to make several of the doughs with great success. 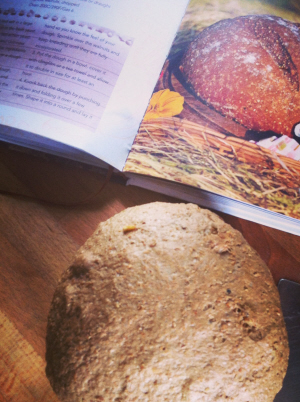 There’s a sourdough chapter which includes advice from Joe Fitzmaurice of Cloughjordan Woodfired Bakery, a wander in the wild with plenty of seaweed, a decent selection of gluten free offerings and even instructions on how to make your own butter, should you be wondering what to place on all that aforementioned baking. Next up at the cottage? I’m tempted by Potato and Rye Semi-Sourdough with Molasses, the Waterford Blaas, a Totally Tropical Banana Bread that also happens to be GF – and maybe even a few more of these irresistible Chocolate Nut Swirls. I normally have a preference for enriched doughs using eggs, milk, a variety of flours and other add-ons like mixed seeds and milled seaweed in an effort to get as much good stuff into a slice of bread as possible. Sometimes, though, it’s not a bad idea to go basic but you could always substitute 50g strong brown flour for 50g of the white flour if you feel the need. Using a large bowl, mix the flour, yeast and salt together. Pour in the water and, using your hand, bring the dough together into a rough ball. Knead on a oiled work surface for approximately 10-12 minutes or until you feel the texture of the dough changing under your hands and becoming smooth. The best way to do this, I find, is to stick on a podcast and think of the kneading as a serious form of upper body exercise. The bread machine dough setting is, of course, another option. Pop the dough back into the bowl and rest (you may feel the same way) under a damp tea towel in a draught-free corner of the kitchen until it has doubled in size. Depending on the temperature of your kitchen, this can take anything from 1-2 hours. To see if it is ready, poke it. If the dent stays, it’s time to move on to the next stage. Gently shake it onto the work surface and fold it several times to get rid of any large air bubbles. At shaping this stage, you can – as documented in Val’s book – take the dough in several different directions: a basic white bread, burger buns, pizza, baguettes, mini rolls – or chocolate swirls. I divided the dough in half, and got the kids to make rolls while I stretched out the rest of the dough into a rectangle, slathered it with chocolate spread and almond butter, rolled it into a swiss roll shape and cut it into pieces. You’ll get 12 out of the full mixture. Spread the melted butter across the bottom of a rectangular (33 x 24cm) swiss roll tin, sit the swirls on top and sprinkle with demerara sugar. Pop back under the damp tea towel and leave to prove 30-40 minutes, meanwhile preheating the oven to 200°C. Best served warm with even more butter. Also good reheated on top of the toaster over the next couple of days. 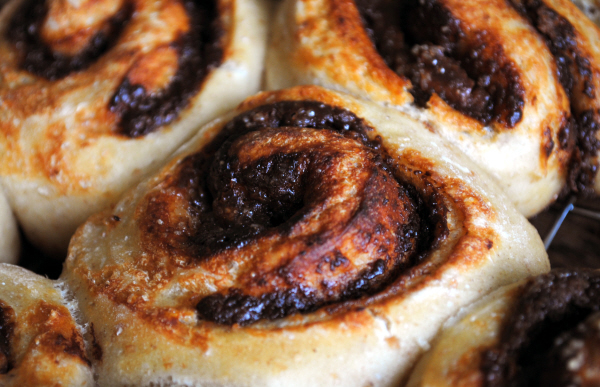 Adapted from Valerie O’Connor’s recipe for Chocolate Swirls in Bread on the Table. Thanks to O’Brien Press for the review copy. Ooh, that looks yummy! I’m on a bit of a bread buzz myself at the moment. It’s quite an addictive habit! I’ve seen Val’s book reviewed a few times now and it looks great – must try to get my hands on a copy. Make sure you leave a comment over at the IFBA site, June! You’re right about it being addictive. I live in the countryside so making it at home is the best way of getting some good bread to my own table. I love to play with different recipes too and Val’s book has a lot of exciting ones to try.